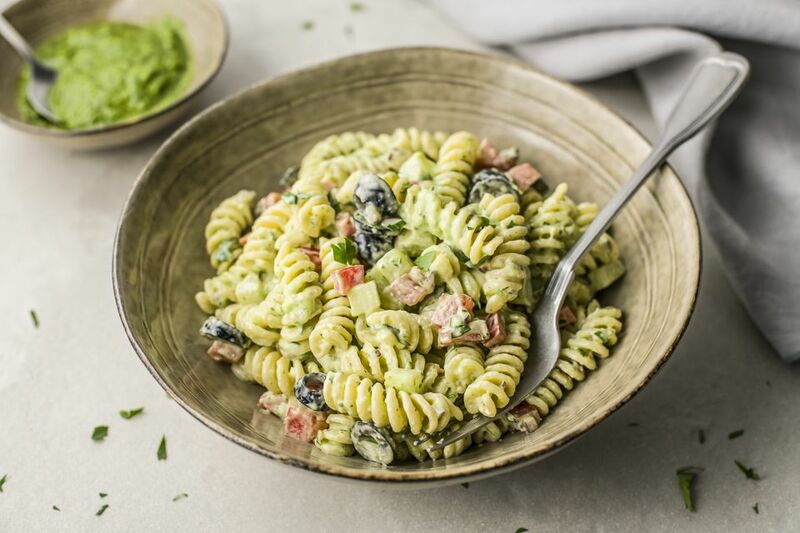 This tasty garden pasta salad is loaded with fresh chopped vegetables. The lemony pesto and mayonnaise dressing flavors the salad perfectly. I used rotini in the salad, but feel free to use farfalle, fusilli, or another similar pasta. To make the salad hearty enough to be a main dish, add some diced cooked chicken, cheese cubes or shredded cheese, or cubed leftover ham, roast beef, or turkey. Cook the rotini pasta in boiling salted water following package directions. Set the pasta aside to cool completely and then transfer it to a large serving bowl. Toss the cooled rotini pasta with the diced cucumber, tomato, sliced ripe olives, bell pepper, celery, and red onion (if using). In a bowl, combine the mayonnaise, pesto, lemon juice, freshly ground black pepper, salt, and parsley, if using. Combine with the pasta and stir gently until blended. Taste and add more salt as needed.